Not to burst anyone's bubble here, but Hammond's run is nothing but a fluke. He's nothing but a career AHLer getting good bounces. When it stops, he will be exposed for the sub-par scrub he is. Hammond will be playing tonight. I have hope as well, only because we have 1 game in hand and another game remaining against the Bruins, giving Ottawa an opportunity to get to within 3 points. At that point on, all they can do is play well and try to get 2 more wins than the Bruins (and any other team in the hunt). If Ottawa fails to get within 3 points, I'd consider them done. (with hamburglar in nets) We need to keep winning that's it and Bruins needs to loose a couple 3 and we're there. The way the Bruins are playing, I think the Sens might need to set their sights on Washington instead. Boston is only 2 points behind the Caps. Frustrating to be sure when you put it that way. But Ottawa had an opportunity to get to within 3 points and failed to do so. So they did make significant ground and could have gone further, but the less to Boston was a kick to the junk in that regard. With Boston on the roll they are, it seems you are right. Boston is now tied, but has taken the No. 1 wildcard spot from Washington. Ottawa remains 7 points out, but again have 2 games in hand on Washington with one game to be played against them as well. How come Hammy is not No1. Goalie right now in the league leader standings? Does it only apply to goalies who played from the start of the season? There's usually a minimum of games played that applies. Not sure what that number is, but he's probably not too far off. What a crazy game, an emotional roller coaster to getting the quick goal to start the game and falling behind just as quickly. Constant back and forth but the Senators battled and hung it out for the win. 2 points baby!!!!!! 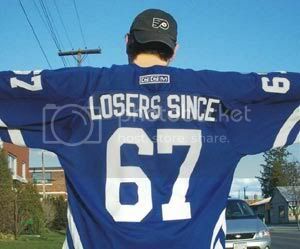 Going to tonight's Sens/Leafs game! I had attended the Sens/Habs game which Hammond made initial start that kicked off this run. My in-laws provided me with the tickets as they hate Sens/Leafs games so I thought it was be appropriate to invite the friend I was with for the Sens/Habs game. Keep the chase on with Boston and Washington, but lets look at the other possibility. Ottawa is now only 4 points behind Detroit whereas they are 5 points behind Washington. Catching Boston puts them into a Wildcard spot, while catching Detroit puts them in the top 3 spots in the division. What I would be more worried about right now is Hammond is showing signs of coming back down to earth and playing like the goalie he was in the AHL. If that's the case, the Sens better get used to scoring 4 or 5 goals per game 'cause they'll need every single one to win. I am not sure it is him coming back down to earth. I haven't seen any goal on him that was completely terrible. There was one during the Boston game where it seemed to graze him, but I believe the shot was deflected as many of those that have beat him. The game against the Leafs was the result of the entire team taking the 2nd period off defensively. They didn't leave Hammond out to dry on any one particular play, but you can't be expecting your goalie to make save after save when you can't clear the zone. Sometimes the goalie gets you a win you didn't deserve, other times your scorers get the win where defensively the team wasn't at its best. They didn't leave Hammond out to dry on any one particular play, but you can't be expecting your goalie to make save after save when you can't clear the zone. If this team is to make the playoffs, then yes, they need the goalie to make save after save after save even when they can't clear the zone. This is not a defense that deserves to be in the playoffs. Easily the worst defense of the 16 teams (plus the Sens) currently in a playoff position. I agree with that assessment MH. My hope for making the playoffs has nothing to do with them achieving any success and some miracle run to the SCF. My hope is more that this group will learn one thing, when you work together and play as a single unit, you can achieve a goal you once thought was impossible. It will teach the players that if they put in a full 60 minute game each and every game, they can be in a much better position next season. It gives the younger guys a taste of success, something to strive for that will fuel their hunger to succeed. Even if they come up short, or get swept in the first round, I feel this team will have learned plenty more about themselves than they would had they continued to spin their wheels in 13th or wherever they were a month ago.